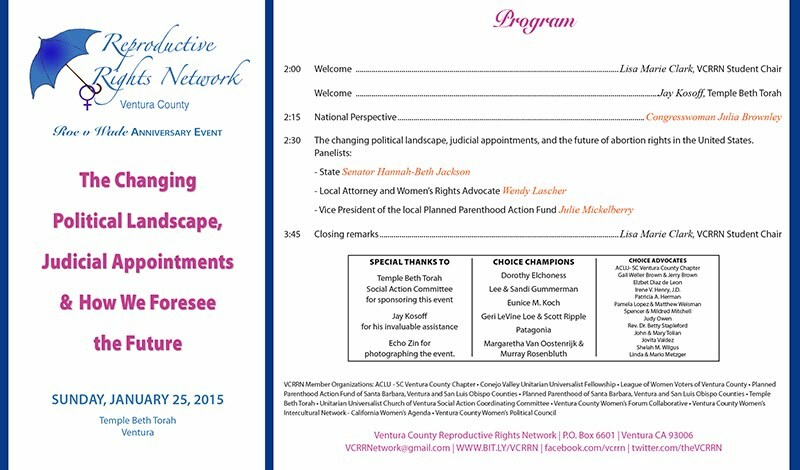 Welcome to the Ventura County Reproductive Rights Network! Jackson, an award winning documentary film about the state of reproductive rights in the American South by Emmy-nominated director Maisie Crow, is playing at the Ojai Film Festival. The film is screening at the Ojai Art Center on Friday, November 4, 2016 at 5:15pm and Thursday, November 10, 2016 at 11:45am. 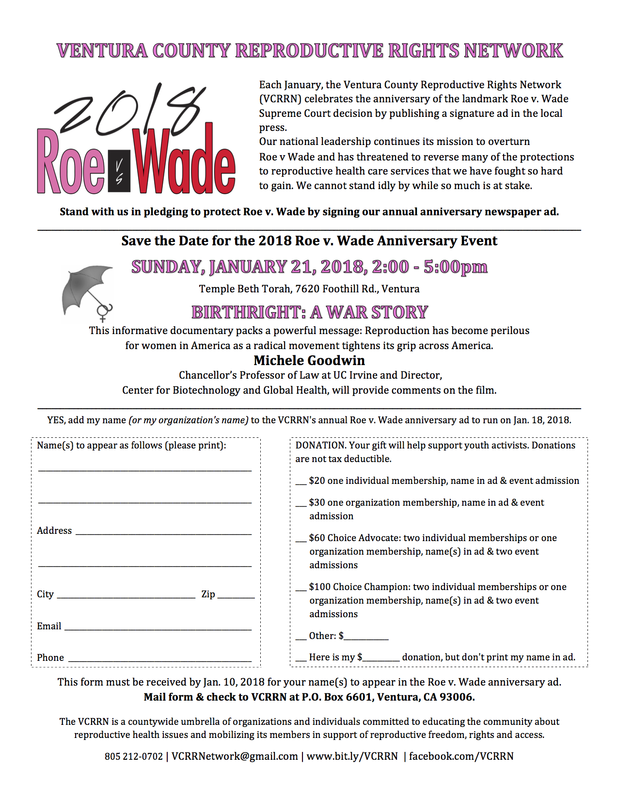 It's time once again for the annual Roe v Wade signature ad and event! Print out this form and send in with your check before January 13th to be included in the ad. Our Whole Lives (OWL) is a comprehensive, factual, sexual education program. From kindergartner to adult, age-appropriate workshops provide information in a safe, positive, and healthy environment. We invite you to attend a free orientation to learn about our Spring classes. Bring your questions and your open mind. *OWL is a secular program created by the Unitarian Universalist Association and the United Church of Christ. 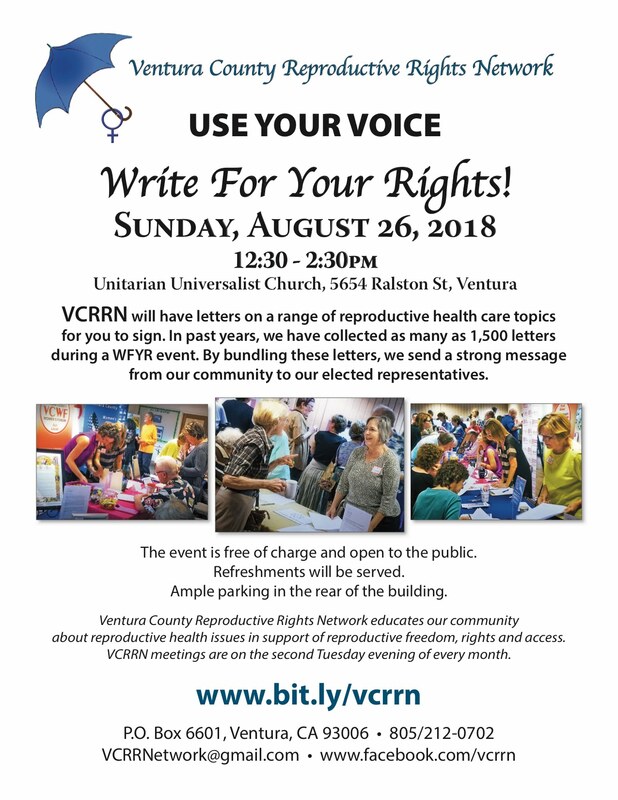 VCRRN's Write For Your Rights provides Ventura County citizens an opportunity to tell our local and national legislators that we stand in support of women's rights and believe reproductive rights are human rights. 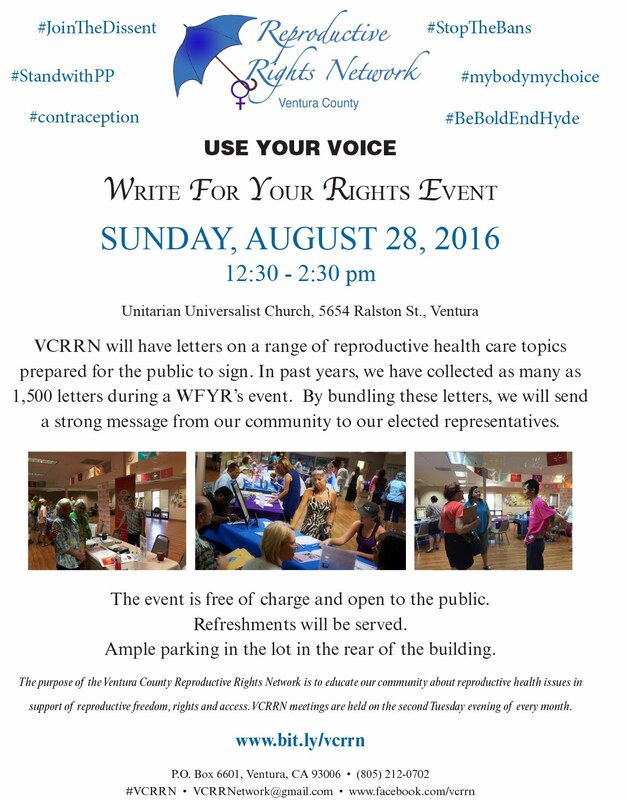 VCRRN will have letters on a range of reproductive health care topics prepared for the public to sign. In past years, we have collected as many as 1,500 letters during a WFYR's event. By bundling the letters, we are sending a strong message from our community to our elected representatives. Refreshments will be served. We will have drawings for door prizes throughout the afternoon. Ample parking in the lot in the rear of the building. 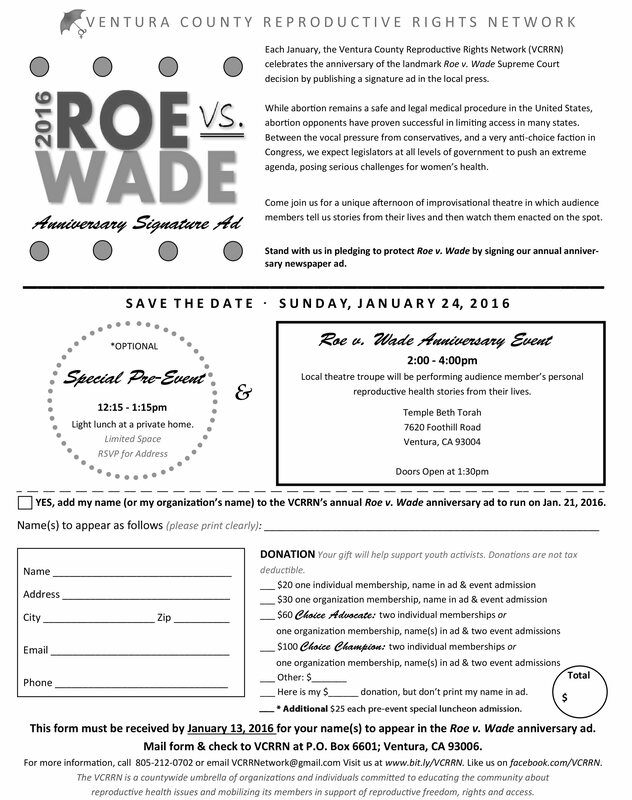 Deadline to be included in this year's Roe v Wade Anniversary Signature Ad is January 12, 2015. Click on the image below and print out the form. The event is free of charge and open to the public. Refreshments will be served. We will have drawings for door prizes throughout the afternoon. Ample parking in the lot in the rear of the building. and Evan Clark is preparing a short video to share his experience in Sacramento. The following are the three bill that Capitol Day attendees discussed with legislators. 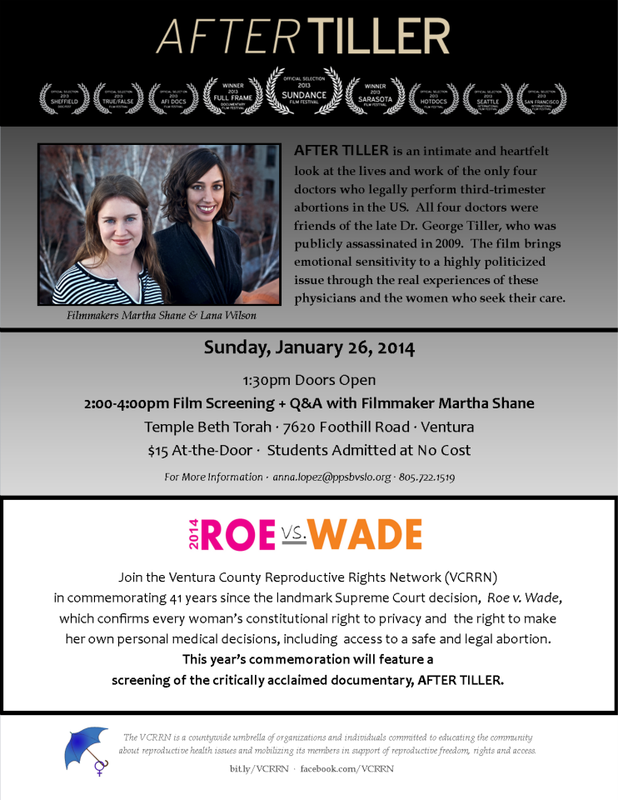 Stand with us on Tuesday, March 25, 2014! On Tuesday, March 25, the Supreme Court will hear opening arguments for the Hobby Lobby case, one of the two cases where lawyers will argue that corporations should have the power to deny employees access to birth control coverage based on the employer's personal religious objections. Bosses should not be able to deny women preventive health care based on their personal beliefs. Birth control decisions are personal, and bosses have no right to impose their views on employees. What will these bosses object to next? 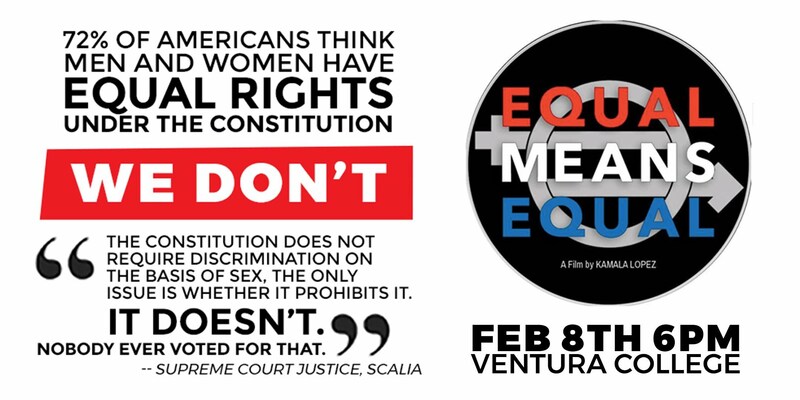 We need to let our community know what’s at stake in this Supreme Court cases! These cases could create, for the first time in American history, legal precedent allowing for-profit corporations to claim a right to religious freedom that would allow them to claim exemptions from a whole host of generally applicable laws. Join us for a visibility rally that day to show your support for access to birth control coverage for all women! We’ll bring the signs. If you can’t join the rally, you can honk in support as you drive by! Feel free to share this email. RSVPing to anna.lopez@ppsbvslo.org if you plan on attending is highly encouraged, but feel free to stop by even if you forget to do so. See you Tuesday! 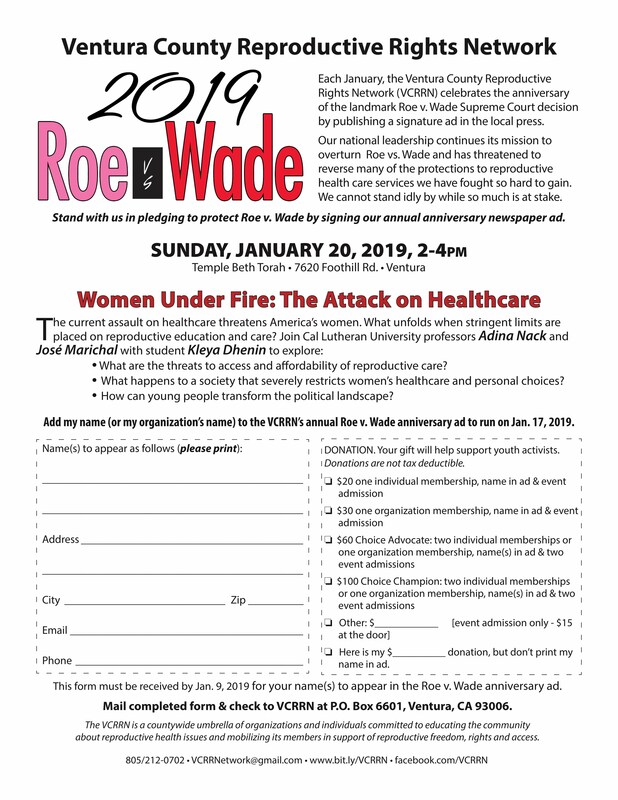 Over the past several years, the VCRRN has awarded travel scholarships to student activists to attend Planned Parenthood’s Capitol Day in Sacramento. This year was no exception and the VCRRN awarded travel scholarships to three bright and promising young women from Ventura County. This event was open to all VCRRN organizations and their members. Panel featured Lisa Hochberg-Miller of Temple Beth Torah. Moderator was Carmen Ramirez, Oxnard Mayor Pro Tem. The VCRRN meetings are held on the 2nd Tuesday of each month. Most meetings are held in Ventura at 6:00pm, but each quarter, a meeting is held in Camarillo at 6:30pm. The alternating is done to accommodate all member organizations. If you are interested in learning more about the VCRRN, or if you would like to attend a meeting, please e-mail VCRRNetwork@gmail.com<mailto:VCRRNetwork@gmail.com>. 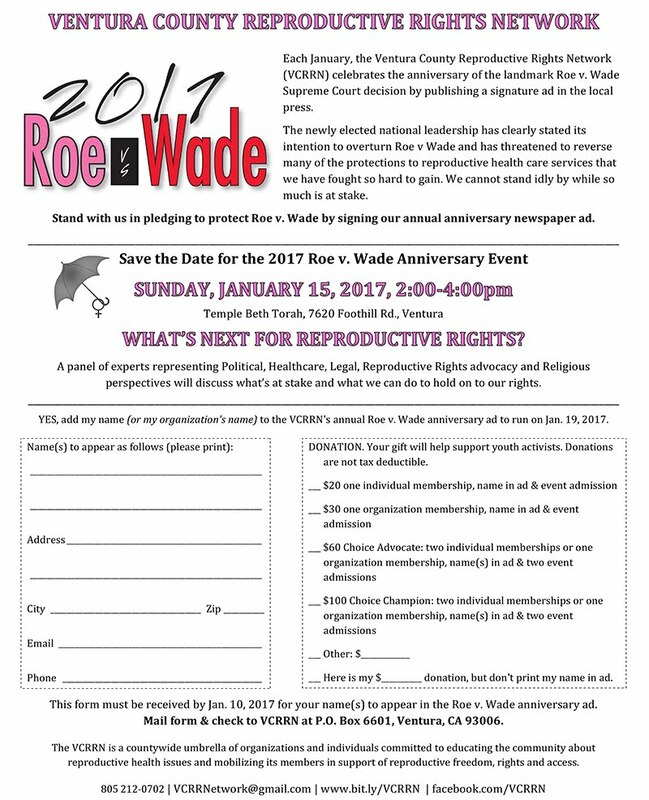 sponsors an annual Roe v. Wade Anniversary event in commemoration of the landmark 1973 U.S. Supreme Court decision. The VCRRN remains dedicated to protecting and advocating for women's fundamental human right to control their bodies and lives through reproductive self-determination. 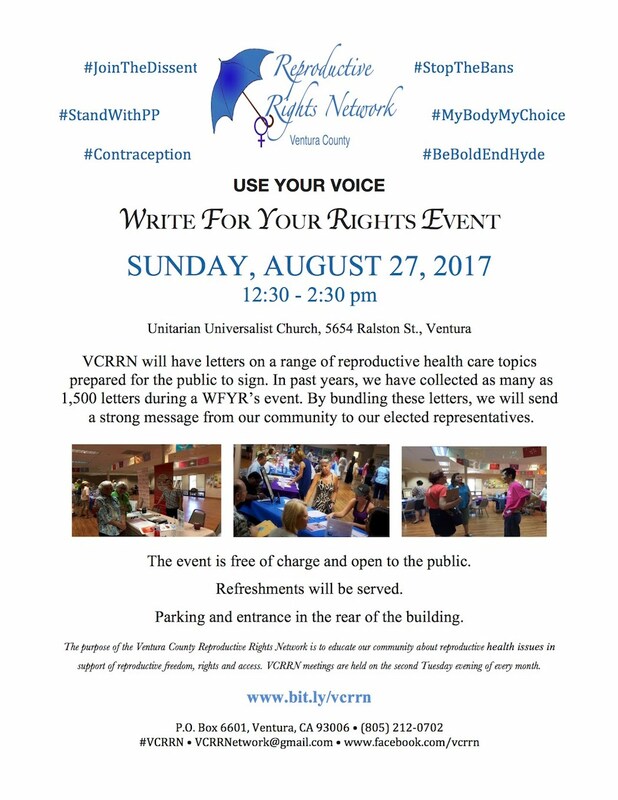 Every August, in recognition of Women's Equality Day, the Ventura County Reproductive Rights Network hosts a large-scale, state and federal letter writing campaign to ensure women and families have access to critical reproductive health and family planning services. The day commemorates the historic passage of the U.S. Constitution's 19th Amendment in 1920, which expanded voting rights to women.